I've spilled a lot of virtual ink in my numerous online missives about scary stories, particularly Scary Stories to Tell in the Dark and its twosequels. But Alvin Schwartz was not the only author to produce collections of scary stories for younger audiences, and he certainly wasn't the first. Maria Leach, for example, had been doing an excellent job laying the groundwork for macabre collections to come in her compendiums of chilling folklore like Whistle in the Graveyard. 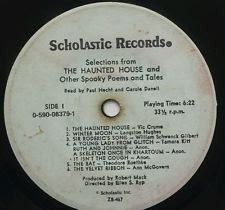 And then there's this curious little number: 1970's Scholastic release The Haunted House and Other Spooky Poems and Tales. 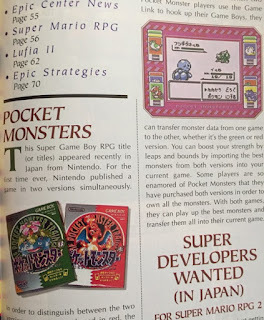 With the recent success of the Pokémon Go mobile game-such a phenomenon that it has popularized that most base and shameful of activities: walking-the original 151 Pocket Monsters have reentered the popular consciousness with a vengeance. Because of this vengeful reentry, my thoughts of late have turned to my own personal experience with the Pokémon games of yore, and the untold tragedy of a fallen friend. Do you see that? That is an actual photo from within my living quarters. Some might say it represents a wall of obsolescence, a shrine to the preferred audio format of a bygone era, when physical copies of your music were a thing and mp3s took a full afternoon to download and were probably just virus traps. Others might say, "Wait...THREE different Kris Kross albums?" Yes, I have a lot of CD's. And, like proctologists, there are some great ones, and there are some bad ones. But then there are the ones that defy such simple categorization, and are not so much good or bad as they are baffling and inexplicable. You will find few greater examples of this phenomenon than those contained within what I have dubbed the Celebrity Wing of Joey Marsilio's EXXtreme CD Collection. Gaze upon these works, ye Mighty, and despair! Or at least like scratch your head or something. Between my screeds about Scary Stories to Tell in the Dark and my critically acclaimed novel, people sometimes forget that I am quite an accomplished comedy writer. I mean, it takes a certain level of talent to create public access television for literal years (let's not speculate on specifically what level that is). In addition to chortle-inducing articles for this blog and my hilarious off-off-Broadway musical comedy Oh, Bridget!, I once wrote a screenplay for a sitcom pilot that my father described as "kind of funny, in places." Why am I telling you all this? Well, you see, I have recently taken it upon myself to begin another intensive comedy proyecto, and I have come to realize in the course of working on it that I could get a twofer going and turn it into a lesson for you, my loyal and enraptured audience. A real master class in comedy, if you will. Allow me to explain. As you may have noticed if you've been paying attention to my blog over the years, I have a, shall we say, staggered posting schedule.You may be tempted to chalk this up to laziness, but the narrative that I'm going with is that I'm not the type to just toss a few sentences about my lunch up online and call it a day. I want to make sure that every single one of my posts is fully realized and interesting, so I space them out and give each one a lot of thought. Quality over quantity, as it were. Trust me, I've made nearly $5 off my blog's ad revenue. Clearly I know what I'm doing. This sort of thoughtfulness goes into my social media posts as well. To wit, the subject of the day: my Instagram. Or more specifically, a set of circumstances surrounding an Instagram post that taught me a valuable lesson using one of the most effective educational tools of them all: crushing disappointment. I spent about a decade or so of my formative years living in a mobile home park that was, at the time, known as Mobileparks West. Not to be confused with a trailer park (despite my parents frequently referring to it as such), Mobileparks West was a community of manufactured homes in which arson was strangely rampant. We eventually had to abandon our home there when we found that the interior of the walls was largely comprised of toxic mold. 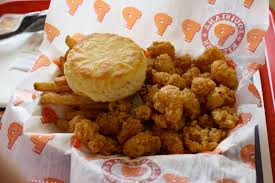 I have spent the last few weeks tirelessly laboring on a thorough Yelp review for a local Popeye's Louisiana Kitchen. I feel my work is important enough that I would like to share it with my blog readers as well. However, since I know my readers are busy people, I've cut away all the fluff and excerpted the most salient material here. I apologize if some of you find this intensely disturbing.